For some other type of pasta than spaghetti with this pesto, try farfalle. 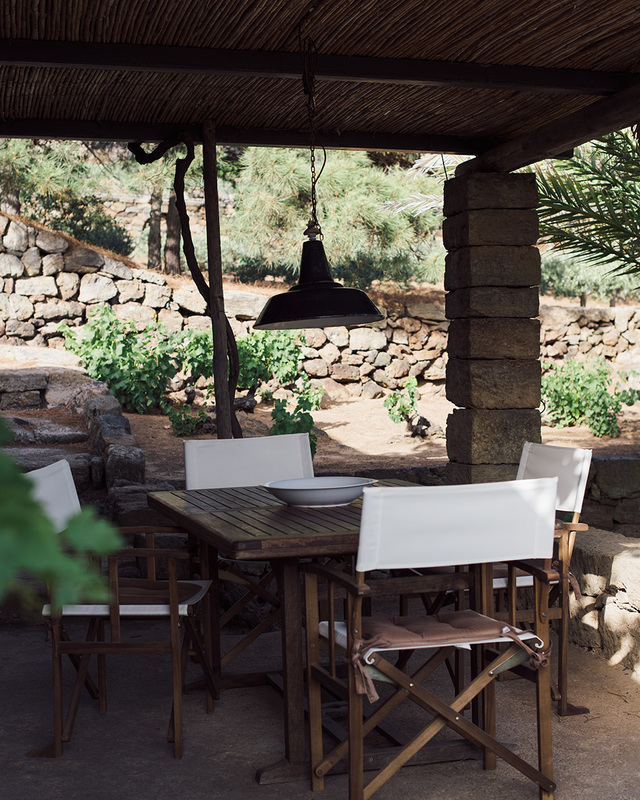 Lunching outdoors in Pantelleria, June 2016. With a glass of verdicchio, the perfect summer lunch at home in Italy. Make the pesto first. 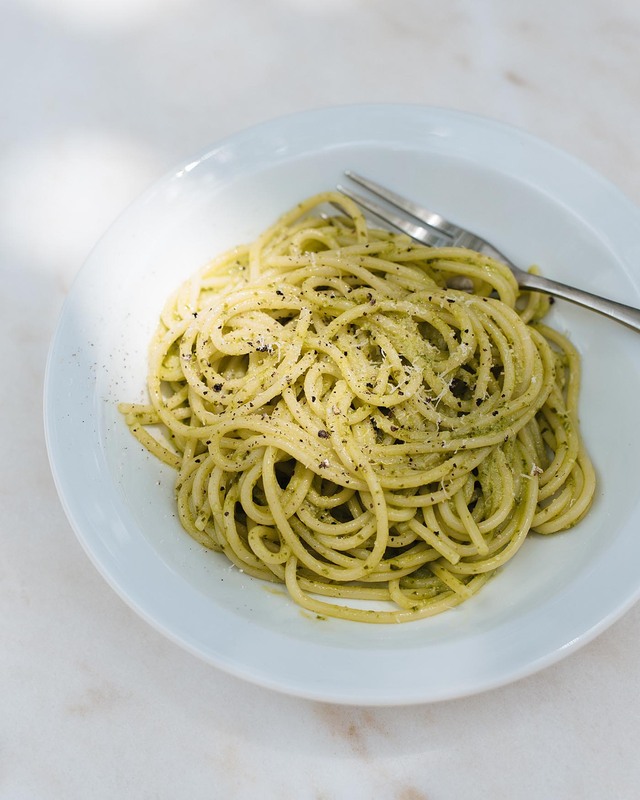 For a balanced taste and consistency, start with the idea of having one part lemon juice, one part olive oil and one part freshly grated parmesan. From that, work with your tastebuds. I use a hand blender and begin by juicing the lemons to the mixing jar. Adding the right amount of oil is easy, as it will not blend to the juice but creates a layer on top of the lemon juice. Then I add the roughly chopped basil leaves in two or three batches and mix until the leaves are finely crushed. Blend grated parmesan to the mix with a spoon, add a bit of salt and pepper, and taste. At this point, add any of the ingredients the sauce needs; lemon for freshness, basil for greenness (yes, that is a taste), parmesan or oil for balance and body, and so on. Move the sauce to a serving dish and cook the pasta. Once it is done, drain the water and pour the steaming pasta over the sauce and blend. Serve with olive oil, salt, pepper and parmesan that everyone can add the amount they like. If you are familiar with Italian dry pasta recipes, there is know way you would not succeed on this one. However, here are some basics that I have found helpful. 2. When cooking pasta, start with a large pot filled with cold water. As water is coming to boil, salt it heavily. Cooking water should taste like the sea. 3. Make sure water is boiling with big bubbles before you add the pasta. The first plunge to the boiling water gives it a temperature shock and is crucial to the texture of the final product. After adding pasta, don’t forget to stir to prevent it from sticking together and cooking unevenly. 4. Cook pasta until it is al dente and pour it in a strainer. Do not rinse or let rest. At this point, you should have your sauce ready. 5. In other words, when the pasta is cooked, blend it with the sauce immediately. Use the pot you made the sauce in, or a serving dish where you have the sauce waiting. For some recipes it is good to save a little pasta cooking water to help the blending process.